Daily Jazba Gujrat is the leading newspaper of Gujrat. Jazba Gujrat is the most famous newspaper of Gujrat. Jazba Gujrat was founded in 1982 as fortnightly and it was converted in a Daily newspaper in 1989. The team of Daily Jazba Gujrat is also publishing Daily Jazba Lahore (started in 1994), Daily Jazba Mandi Baha ul Din (1996), Daily Jazba Mirpur(1999). Jazba International is published from Europe. 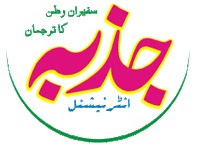 It was started in 1999.
eJazba.com is the official website of Daily Jazba. People of District Gujrat from all over the world access this website to read news about their homeland. It publish Urdu news about Gujrat, Sara-i-Alamgir, Sialkot, Mandi Baha ul Din, Azad Kashmir and other nearby cities and towns. You can also find international news about Japan, Canada, Australia, UAE, Italy and many other countries. Jazba newspaper has not only a experienced team in Pakistan but also has its correspondents in foreign countries. Online Newspaper G U U J R A T.
Slamz; I belong to Peshawar Khyber-Pakhtunkhwa aur me aap k city Gujrat ke ek larki ko be inteha chahta huen but mujy is waja se reject kr dya gaya bcz mera kasoor sirf itna tha k me Pukhtun society se belong krta huen, aap k khayal me kya mery saath ye ziadti nai hai agr hai to plz tell me k mujy ab kya step uthana chaiyey? my child nouman ur way of thinking is immatured.even not possible punjabi go to peshwar and see a beautiful girl and submit application to her parents. not possible. pakhtoon ppl kill even who look. plz. i advice u to stop thinking further. otherwise u will put urself in problems. do not upset the whole life of girl as well as u too. hope - enough for u.